2 Bedroom Guest House w/Mountain Views and Outdoor Adventure! Welcome to beautiful Jim Creek Cabin! We are so excited to have you come and share our magnificent location with its mountain views, activities and wildlife. Located approximately halfway between Yellowstone National Park and Cody, Wyoming, Jim Creek Cabin provides an excellent base camp for all of your northwestern Wyoming adventures. Surrounded by the Absaroka Mountains and bordered by Jim Creek, this cabin offers comfortable beds, hot showers, a full kitchen and space to unwind combined with easy access to adventure. The cabin is only 1/4 mile from the Jim Mountain Trailhead for access to the Shoshone National Forest. *Hunting - Hunters please note: This cabin sits next to the Jim Mountain Trailhead and has excellent access for elk units 53 and 56, deer unit 111 and sheep unit 2 in addition to close proximity to all North Fork units. 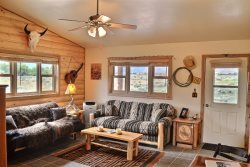 The cabin is hunting and fishing friendly and available year round. Note: Property is approximately 2 miles up a dirt and gravel road that is steep and rough in a few spots. We have easily driven up it in front-wheel drive cars, but some vehicles may not be suited for it and some drivers may not be comfortable with it. *Outdoor fire pit at cabin and a second one near Jim creek. Note: We do include firewood. *The cabin has no cell phone service, but a landline phone is available for emergency and local calls. Cell phones do work just a short walk from the cabin. *No AC, but ceiling fans are in the two largest rooms and temperatures typically cool off to the 50s at night. *Nearby Yellowstone Valley Inn has laundry facilities available for your use. Yellowstone Valley Inn also has an excellent menu if you wish to dine out. Beautiful views, well-kept cabin with all the necessities, property owner was extremely helpful in answering questions about the area and making sure we were comfortable throughout our entire stay. I did most everything online with the exception of payments. When I did call in to make the second payment, the person was friendly and the call was quick. I immediately got an email confirmation. This is my first experience with Cody Lodging Company. NO problems or issues - very good experience. We loved the property. The Jim Creek Cabin was cozy and very clean. The beds were comfortable and the kitchen had all the utensils and items we needed to make breakfast and dinner. The owners were very friendly and accommodating. The porch swing was my favorite place in the morning - so quiet and peaceful with an amazing view. The Cabin was exactly how we expected and the owners were so nice to visit with!!! We cant wait to come back again!!! Awesome location for activities in Cody and Yellowstone. Owner was friendly and knowledgable of the area. Accommodations were awesome. Your team was very helpful and prompt in answering our questions! We had a such a wonderful time! The property was beautiful and more than expected. Everything was incredibly clean and comfortable. The owners were very welcoming and went above and beyond to make sure we had everything that we needed. We will be planning another trip soon! All of my questions were answered promptly. We had a wonderful time staying in the cabin. It was a fantastic place to gather after a long day of fishing and exploring the countryside. The view was phenomenal. It was an excellent location for stargazing. There was plenty of room for the entire family. The beds were comfortable. The interior design was a combination of rustic country and modern convenience. We were all sad to leave. I was looking for a cabin to stay at in the Cody Wyoming area. I found your website and looked at several properties. I sent a couple emails asking about the properties and I got a very quick response. I spoke with Erica on the phone and had my reservations done very quickly. During my stay I had an opportunity to go to Utah to a Conference with friends from home and I was able to book the Cabin for a few more nights as it was available with one call to Sandi. I appreciate your effort to make my stay memorable. I stayed at Jim Creek Cabin from 6/13-6/20/16. The Property owners live next door and were very nice. The cabin is brand new. It is over 1 1/2 miles from the road up the mountain to the cabin. The scenery is spectacular at all times of the day and night. The owners have horses and there was an abundance of rabbits. I didn't see any big wildlife but I'm sure it was there. The cabin doesn't have Cell Signal much to my delight and annoying to my kids. A short drive up the mountain to get signal. It has Wifi and Television although I only had the TV on once. There is a Picnic Table with a fire pit close by and this was one of the things I wanted to enjoy on this trip. The cabin sleeps 6 so it was more than accommodating for me. There is a gas stove, large fridge, microwave, gas grill outside and large dining table. This would be perfect for a family with children or even 2 couples. Being back home on the East Coast with the oppressive humidity I am remembering my trip and stay on Jim Mountain fondly to say the least. I would love to stay there again. The person I spoke with when I booked the cabin was excellent. Very fun and energetic. The property is great. views are awesome. Cabin is very comfortable and clean. This does not compare to the owners hospitality and kindness. Very class act people. Did everything to make our stay the most memorable it could be. Thanks again.